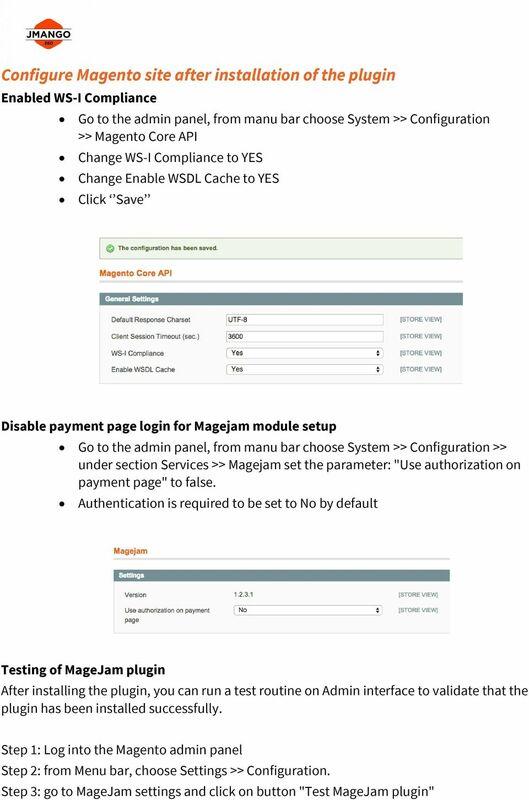 Download "MAGEJAM PLUGIN INSTALLATION GUIDE"
5 Configure Magento site after installation of the plugin Enabled WS-I Compliance Go to the admin panel, from manu bar choose System >> Configuration >> Magento Core API Change WS-I Compliance to YES Change Enable WSDL Cache to YES Click Save Disable payment page login for Magejam module setup Go to the admin panel, from manu bar choose System >> Configuration >> under section Services >> Magejam set the parameter: "Use authorization on payment page" to false. 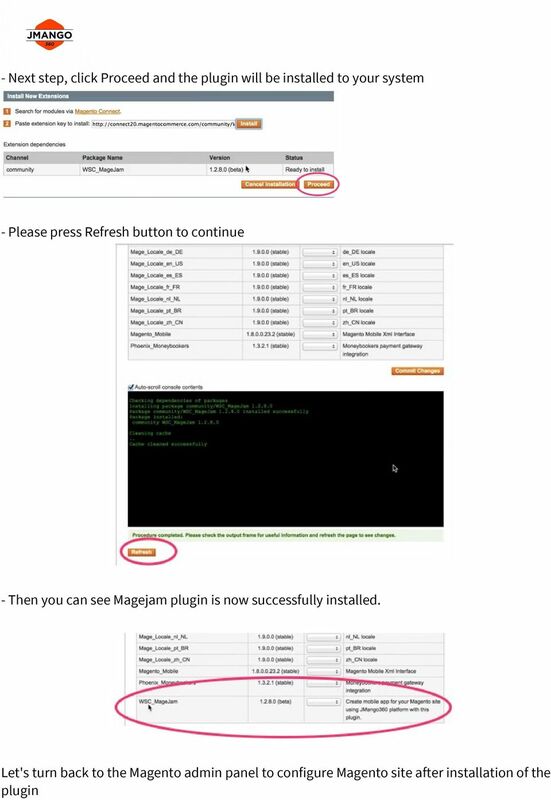 Authentication is required to be set to No by default Testing of MageJam plugin After installing the plugin, you can run a test routine on Admin interface to validate that the plugin has been installed successfully. 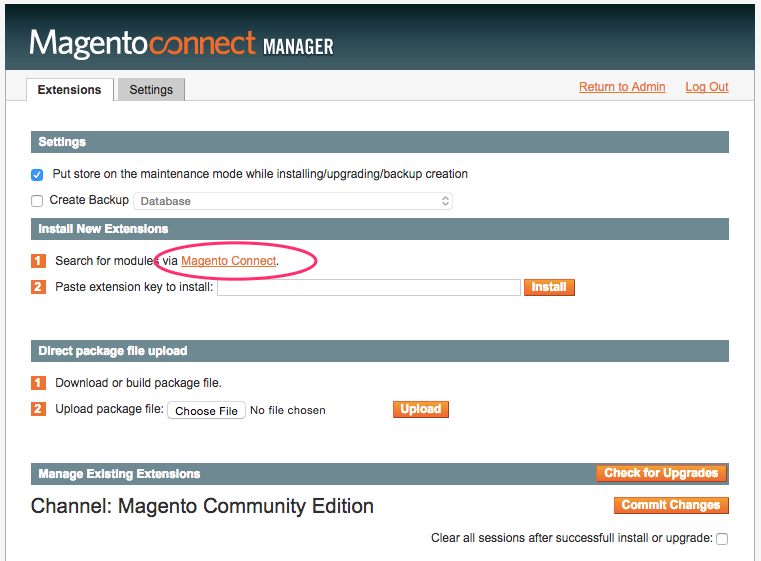 Step 1: Log into the Magento admin panel Step 2: from Menu bar, choose Settings >> Configuration. 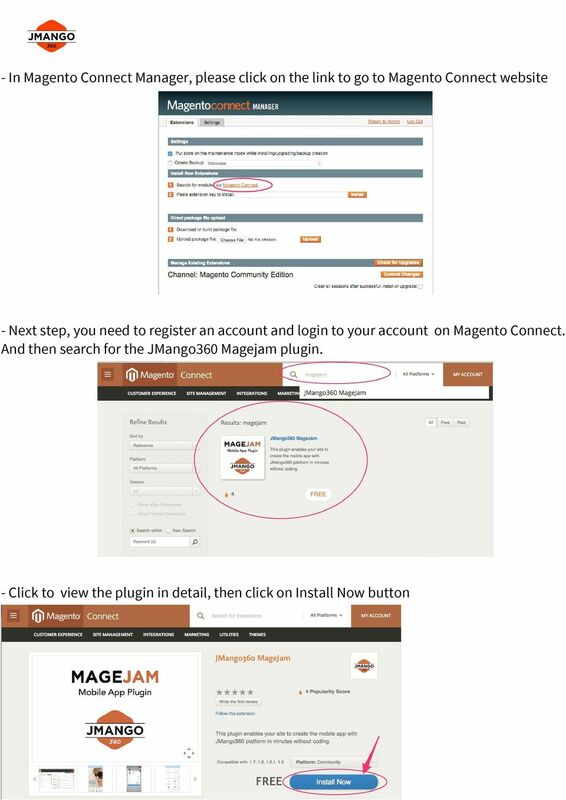 Step 3: go to MageJam settings and click on button "Test MageJam plugin"
6 Step 4: Complete the form with following information. - Select test store: please select the store which will be used for mobile app when integrate with JMango360 - Select test customer: please choose a customer with valid default shipping and billing address for testing shopping cart function. - Click "Test plugin cart operation" button, shipping method and payment method list will be displayed. The testing finished successfully. Create API role Go to System >> Web Services >> SOAP/XML-RPC Roles Click orange button 'Add new Role' in right corner on the tab Role Resource select Resource Access >> All. Create API user Go to System >> Web Services >> SOAP/XML-RPC - Users Click orange button 'Add new User' in right corner Fill User Info On the tab User Role don't forget to choose the role you have created on previous step Click orange button Save User Check that the wsdl is visible to external system open the URL as per following: <base site URL>/api/v2_soap?wsdl (this URL should return some XML data for the webservice definition.) You're now ready to integrate with the site via JMango SOAP. 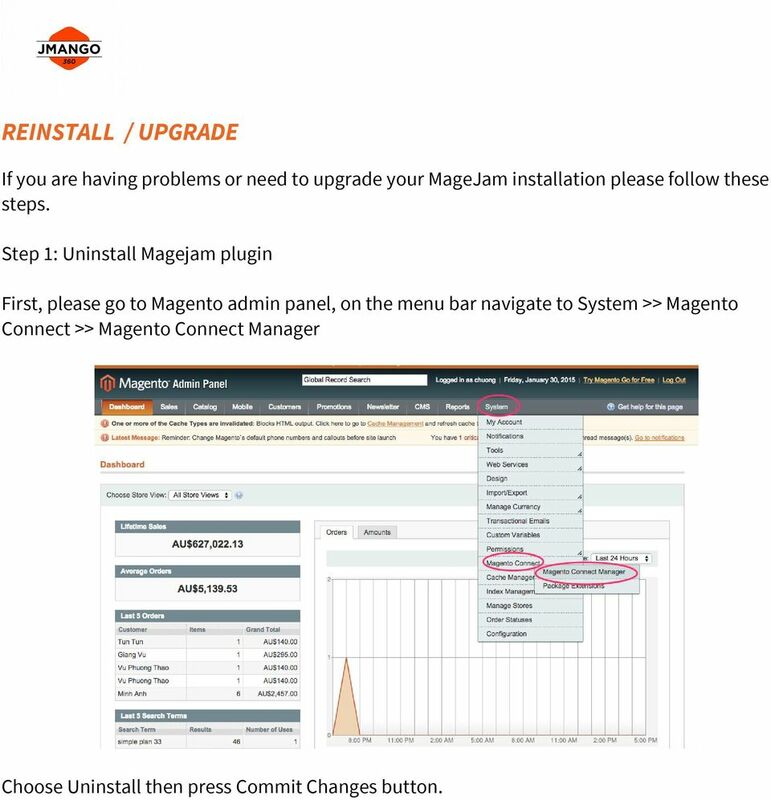 7 REINSTALL / UPGRADE If you are having problems or need to upgrade your MageJam installation please follow these steps. 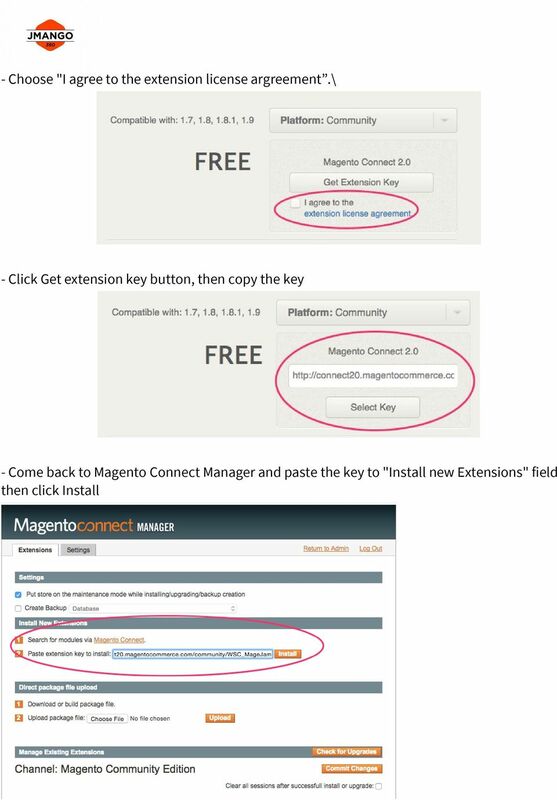 Step 1: Uninstall Magejam plugin First, please go to Magento admin panel, on the menu bar navigate to System >> Magento Connect >> Magento Connect Manager Choose Uninstall then press Commit Changes button. 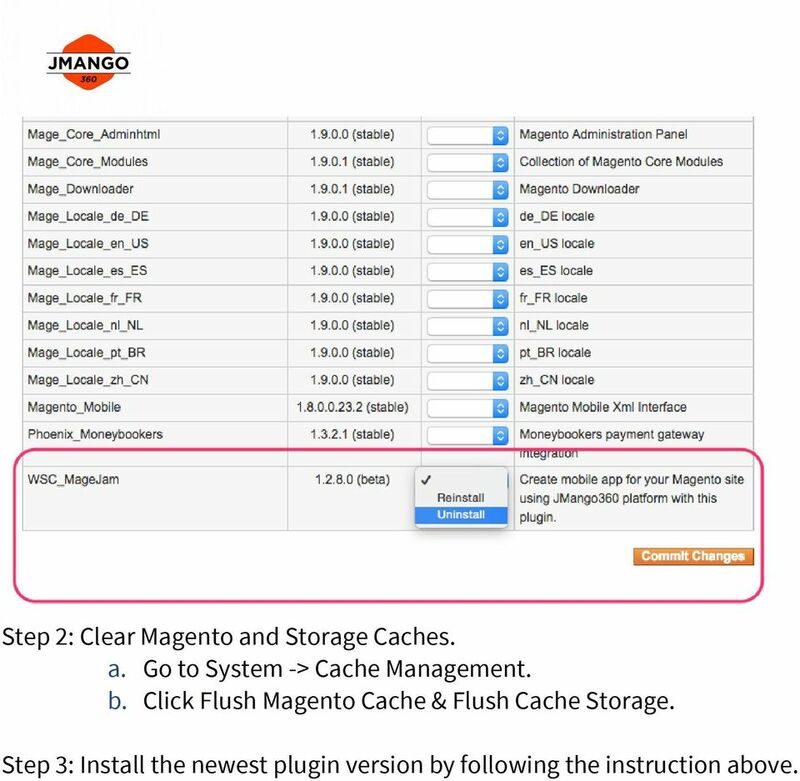 8 Step 2: Clear Magento and Storage Caches. a. Go to System -> Cache Management. b. Click Flush Magento Cache & Flush Cache Storage. Step 3: Install the newest plugin version by following the instruction above. Product Name: ANZ egate Connect Version: 2.1.9 Document Type: Help doc Author: Milople Inc. 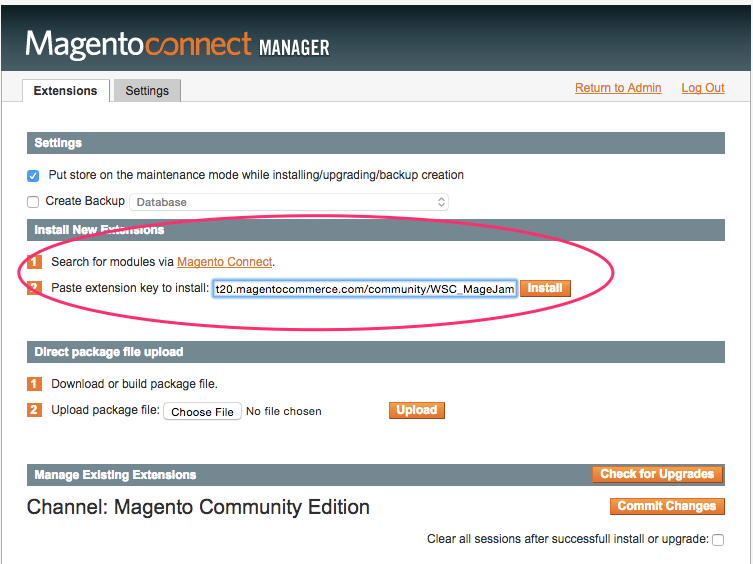 Installation Instructions Nochex Payment Module for Magento A guide for the installation of the Nochex payment module for Magento. 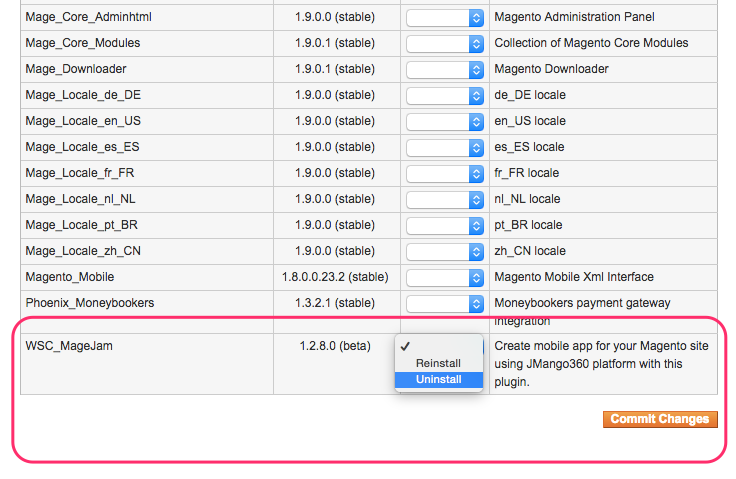 All the information you need to start accepting Nochex payments in Magento. Cloud Fulfilment. 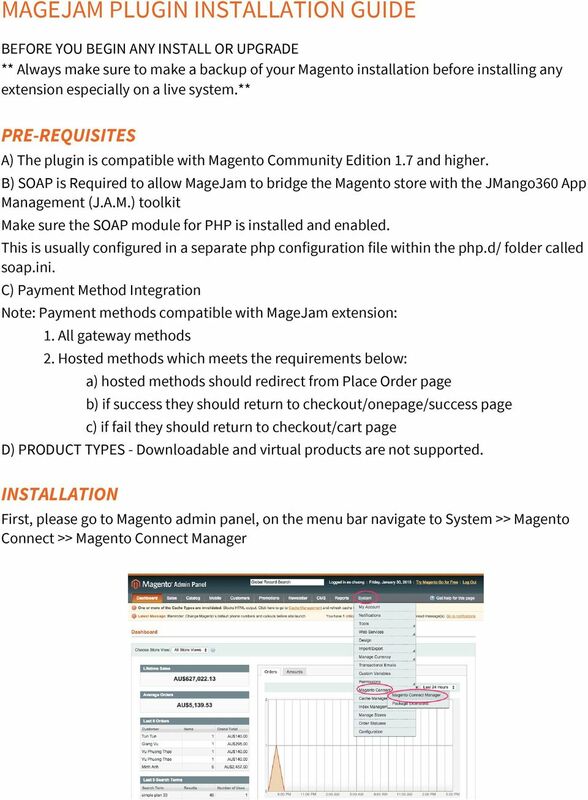 Magento Integration Document. For API Version: 1.0. Document Version 1.0 June 2013. Cloud Fulfilment Magento Integration Version 1. Version 2.0.0 Contents 1. RELEASE NOTES...3 2. MODULE FEATURES... 4 3. PREREQUISITES... 5 4. INSTALLATION OF THE PAYMENT MODULE... 6 4.1. Package description... 6 4.2. Installation of the module... 6 5. 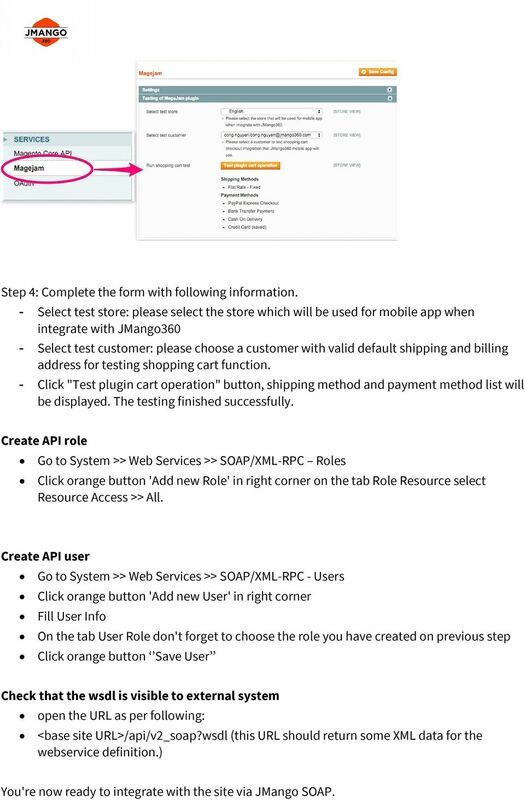 PowerPay Checkout Magento Module User Manual Support: it-support@joinusag.ch This document explains installation procedure and configuration options for Joinus AG PowerPay checkout magento payment module. Product Name: Size Chart Popup Version: 2.0.1 Document Type: Help doc Author: Milople Inc.
1. GENERAL INFORMATION... 3 1.1. 3 1.2. 3 2. PROCESS AND WORKSPACE OVERVIEW... 4 2.1. 4 2.2. 5 2.2.1. 5 2.2.2. 6 2.2.3. 7 2.2.4. 9 2.2.5. Your plain English guide to linking your Magento store to PostageSupermarket. CHARGE Anywhere Universal Shopping Cart Version: v1.0.1 Prepared for: CHARGE Anywhere 4041B Hadley Rd South Plainfield, NJ 07080 Phone: + 1 (800)211-1256 Fax: + 1 (732) 417-4448 I. Introduction... 3 II. 1. How do I access my VPS control panel?